Over a span of several months I was trying to find different ways of approaching the market. One of the books I “dug up” from the bowels of the Internet was at a delightful Canadian outfit called Sabine’s Bookshop located on Salt Spring Island in the Straight of Georgia, British Columbia, just a tad northwest of Washington State and southwest of Vancouver. From there a lonely little copy of Ernest Henley’s Echoes of Life and Death (Mosher, 1908) was selected to be in the collection, not because of anything really outstanding, but because it had an unusual dust jacket with an embossed and hand-colored coat of arms showing a British flag over the fleurs-de-lis de lies all surmounted by two crossed swords, a crown, and a motto banner at bottom with the words “Wolfe et Montcalm” There are three pages of manuscript poetry on the final endpapers, and an embossed mark of “Ex Libris A. Stanley Deaville” on the front endpaper. I have no idea to whom the coat of arms belongs, nor could I find anything on the Deaville name, but I thought it curious enough to include, especially since it was Canadian. Speaking of Canada, a friend of mine recently moved from Regina, Canada to Victoria on the West Coast. 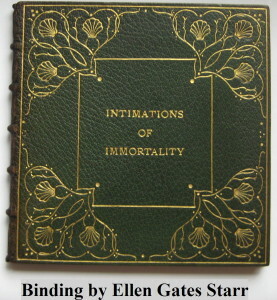 Just before departing he mentioned that he noted my interest in female binders and asked if I’d be interested in a binding by Ellen Gates Starr on Wordsworth’s Intimations of Immortality–An Ode printed by Mosher in 1908. It’s signed “E.G.S., 1911” on the back lower inside turn-in and contains a hand-written presentation note by Starr. He had obtained it back in October 2007 and we discussed it off and on ever since. 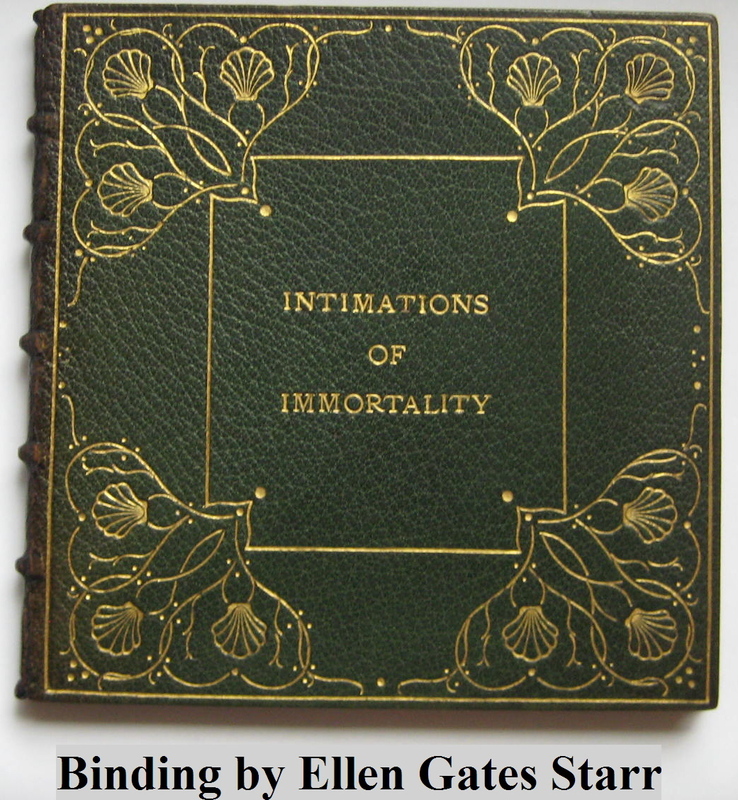 Strangely enough during all my years of collecting bindings on the Mosher Books, I never once came across a binding by Ellen Gates Starr who trained under Cobden-Sanderson and who became an important figure in the bookbinding world in Chicago. She co-founded Hull House in 1889 along with Jane Addams and there she worked out of the Hull House Studio while also teaching bookbinding. Examples of her handicraft are difficult to find, and to have one offered in exchange for some three-quarter bindings on Mosher books was an exchange I was pleased to make. My friend had noted my keen interest in bindings by female binders, so he offered to send the book “on approval” and I could put together whatever Mosher books in bindings I was willing to sacrifice. It was a four for one deal, and I just found out that he’s pleased with the bindings I sent, two of which are on Japan vellum copies of the Mosher Books. Thanks Sir James! So welcome Ellen. You have an honored spot right next to several of your protégé’s bindings (Peter Verburg), and bindings by Florence Foote who too studied under Cobden-Sanderson of the Doves Bindery, close to Elizabeth Utley (later Thomas) who studied bookbinding along with Rachel MacMasters Miller (later Hunt) under Euphemia Bakewell –another student of Cobden-Sanderson’s– and L. Averill Cole, a California binder who studied under Louis Jacobs and Joseph Hendricks in Brussels, and who later became the head of the hand bindery at Houghton Mifflin’s Riverside Press in Cambridge, MA. Miss Gaskell of the Guild of Women-Binders politely nods in your direction and Mary Stuart Kernochan of New York bids you a hearty how-do-you-do, along with a bevy of binders like Cora Buck, Eva Clarke, Eleanore I. van Sweringen, Elizabeth Hovey Parker and Hazel Dreis. Even relative late comers to the binding profession like Charlotte Strouse, Silvia Rennie, and Charlotte Ullman are all glad you decided to join them while the bindings by their male counterparts grumble. Make room boys, Ellen’s here!